A recurring question I get is something along the lines of, "I'm six feet tall and weigh 230 pounds. Is the Fly Baby cockpit big enough for me?" First off, there's really only one way to know: Find a Fly Baby, and sit in it. Keep in mind that the builder will have set the cockpit up for his or her own leg length. But you're probably asking just to get a general idea of whether the cockpit has enough room. Pete Bowers was 6' 2" tall, with a light build. I'm six feet tall, and my maximum weight was about 275 lbs. Years ago, I was measured by an anthropometry machine, and just about all of my body dimensions (with the exception of height) are at or above the 95 percentile point. So, essentially, there's a 95% probability you'll have enough room in the Fly Baby. The inside width of the Fly Baby cockpit is about 22 1/2" inches. Leg room can vary, depending upon where one sets up the rudder pedals. The builder of my aircraft was, I think, bit short. In addition, he used production-type rudder pedals with built-in toe brakes, which are a bit thick and rob a bit more of the legroom. I'd love another inch or two of shoulder space. N500F had enough legroom for me, but my current bird doesn't. Just out of general principles, I'd love another inch or two more. I've been toying with a project I call "Fly Baby Grande" for years...a Fly Baby with a skoosh more shoulder space and leg room. However, it isn't as easy as you might think. Getting more leg room probably wouldn't be too bad... just design the forward fuselage to have the firewall positioned two inches further forward. Other than some minor dimensional changes...and, of course, the need to look at CG *very* carefully... this probably wouldn't be too much trouble. However, increasing the width would be awkward. A longer forward cockpit won't cause a snowball effect of changes, but changing the width would. The instrument panel would change, the landing gear axle would be longer, the turtledeck would widen, the aileron pushrods would need to be longer, etc. etc. etc. As I mentioned, I'm statistically very close to the upper end in many body dimensions. One of these was shoulder width...I'm at the 98 percentile. It feels a bit tight in winter, when I'm bundled up in a sweatshirt and leather jacket, but it's not painfully tight. Unless you're a bodybuilder, you're not likely to have trouble with the shoulder room. For those who need legroom, there are several things you can do to maximize your legroom without altering the structure. First, use the stock welded-tube rudder pedals and heel brakes. Toe brakes, like on my airplane, are a lot thicker and the pedal assemblies must be mounted further aft to ensure they miss the firewall when the pedal is depressed. Second, don't put too much recline on your seat. It's surprising how much leg room the seat can steal. My airplane came with a very nice upholstered seat, with the basic fiberglass ultralight seat in the middle. Very comfortable to sit in...but it was slightly reclined, which moved my rump forward and thus gave me less legroom. Third, keep stuff off the cockpit floor, if you can avoid it. Part of feeling that there's sufficient legroom is the ability to move your legs around a bit. If you put a battery or avionics box on the floor, this restricts how much you can stretch out in flight. Finally, if you buy an airplane that's short of legroom, like I did, there are one or two things you can do to gain an inch or so back. In my case, the rudder pedals were set far enough back that they didn't reach the firewall at full travel. The rudder cables were attached to the pedals via slim steel straps. I built a new set of straps, a couple of inches longer, with intermediate holes. I selected the set of holes that gave full travel at about the point the pedal contacted the firewall. I ended up with about an inch and a half extra legroom. But Chris Brown probably takes the trophy for modifying a stock Fly Baby to suit a long-legged pilot. Chis is a tall drink o' water...about six feet five inches. He bought a wrecked Fly Baby years ago, and rebuilt it into a trophy winner. That's his red-and-black airplane, at the top of this web page. So: What did Chris do? First, let's look at the stock cockpit setup. 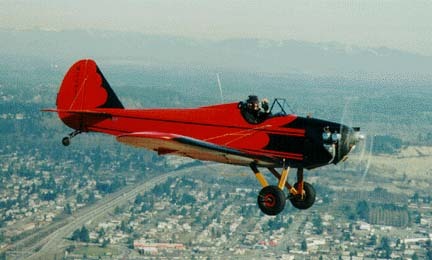 On the stock Fly Baby, the lower longeron defines the shape of the belly of the airplane. It curves from the firewall all the way to the tail post. In the cockpit area, though, the Intermediate Lower Longeron defines, essentially, the level of the cockpit floor. Bulkheads, traverse longerons, and filler blocks connect the Intermediate and the lower longerons. Between the firewall and Station 3 (the instrument panel bulkhead), the cockpit floor mounts atop the Intermediate longeron. The rudder pedals mount atop this floor, and your brake cylinders are either below or above his floor. The first change Chris did was to move his floor to the bottom of the lower longeron, instead of the top of the intermediate longeron. This lowers the floor about two inches, which gives about the same effective increase in legroom. Conversely, lowering the seat (actually, making the seat base less thick) gives an effective increase in legroom as well, since the lower seat moves the pilot's knees downward. Normally, you'd still be limited as to how far forward you can move the rudder pedals, because of the firewall. What Chris did was install metal "dents" in the firewall to allow the rudder pedals to actually pass through the plane of the firewall. I call these dents, "Buckets". The "Buckets" have to be large enough to not only let the rudder pedals swing forward, but they have to be large enough to let your shoe push the rudder pedals without touching the side of the bucket. If you're foot's bigger than the bucket, you can't push the rudder pedal all the way to the stops. Many homebuilt airplanes have a similar solution, but with the entire width of the firewall instead of the individual "Buckets" for the rudder pedals. The "Buckets" form a part of the firewall, and hence their construction and sealing is critical. They should really be made out of the same material that is on the engine side of the firewall...stainless or galvanized steel. Since it was difficult to fit the brake cylinders in the new recessed floor, Chris moved them to behind the seat and installed small heel brake pedals near the rudder pedals. The brake pedals are connected to the brake cylinders by cable. Here's a picture taken from the cockpit of Chris' airplane, facing forward. Note the lowered floor, the buckets, the small pedal on the floor for thecable-activated heel brakes, and the springs mounted to both the rudder and brake pedals to return them to the upright position.